Do you think "blueberry" is a good nickname for the Navy's blue and gray digital camouflage uniform? Why or why not? Based on what you read in the article, why do you think the "blueberry" could be one of the most hated military uniforms of all time? 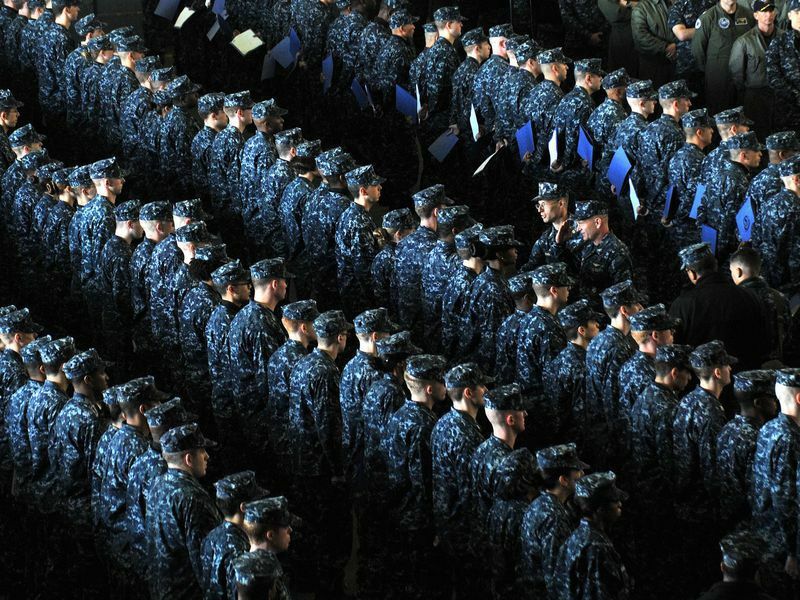 Based on what you read in the article, why could it be dangerous for sailors to wear the "blueberry" uniform while at sea? Why do you think designers failed to notice this drawback when creating the uniforms in the first place? According to the article, sailors want uniforms that are comfortable, lightweight and breathable. What other features do you think would be desirable in a Navy uniform? As a class, identify each branch of the U.S. military. (Army, Navy, Air Force, Marine Corps, Coast Guard) Invite students to share what they know about the uniforms people wear in each branch. Write the following words on the board: comfort, utility and appearance. As a class, discuss what these words mean. Identify reasons why each trait is an important part of a military uniform. Divide the class into small groups. Assign each group a branch of the military or instruct students to select a branch of their own. Have students conduct research to learn more about the uniforms worn by people in their assigned branch. Based upon their research, challenge students to identify one or more ways current military uniforms could be improved, particularly with respect to comfort, utility and appearance. Give groups time to brainstorm ideas and complete a detailed, color drawing of their new-and-improved uniforms. Instruct groups to create a display that showcases their new uniforms that identifies notable improvements in their designs. Invite students to share their uniform designs with the class. Encourage classmates to examine the designs to determine how well the uniforms improve the comfort, utility and/or appearance of current military uniforms. Point out that people in the military have more than one type of uniform. For example, there are work uniforms and dress uniforms. Discuss instances where people might wear each one. Divide the class into six groups. Assign each group one branch of the U.S. military. Instruct groups to conduct research to learn about uniforms worn by people in their assigned branch. Provide assistance as needed. Have students brainstorm ideas to improve the comfort, utility or appearance of the uniforms. Challenge each group to design a work or dress uniform for people in their assigned military branch. Divide the class into six groups. Assign each group one branch of the U.S. military. Instruct groups to conduct research to learn about work and dress uniforms worn by people in their assigned branch. Have students brainstorm ideas to improve the comfort, utility or appearance of the uniforms. Challenge each group to design a work uniform and a dress uniform for people in their assigned military branch. Divide the class into small groups. Instruct each group to select a branch of the U.S. military. Have students conduct research to learn about the uniforms worn by people in their selected branch. Tell them to focus on either work or dress uniforms. Challenge students to identify one way to improve the comfort, utility and appearance of the work or dress uniforms worn by people in that branch of the military. Divide the class into small groups. Instruct each group to select a branch of the U.S. military. Have students conduct research to learn about the work and dress uniforms worn by people in their selected branch. Challenge students to identify one way to improve the comfort, utility and appearance of both the work and dress uniforms worn by people in that branch of the military. Use this Smithsonian History Explorer resource to guide students as they describe an artifact—the official uniform George Washington wore from 1789 until his death 10 years later—and analyze its historical meaning. This lesson plan from the National Museum of American History uses primary sources as the inspiration for comparing and contrasting soldiers on either side of the Civil War. After examining uniforms and viewing two short video clips, students will develop questions and conduct short research projects to uncover the motivations behind the Civil War and the conditions for the soldiers who fought. This online exhibit from the National Museum of American History examines how wars have shaped the nation’s history and transformed American society. This lesson plan from the National Museum of American History has students analyze museum artifacts and first-person accounts of daily life as a soldier in World War I and the Vietnam War. After research, students take on different roles to create a newscast about the experience of fighting in these two wars. During World War II, Navajo code talkers proved instrumental in securing key Allied victories. Read this Smithsonian article to learn how the National Museum of the American Indian plans to honor those veterans and the thousands of other Native Americans who have or are currently fighting on behalf of the United States. Since WWII, the U.S. military has trained dogs to become some of their most useful soldiers. Watch this Smithsonian Channel video, shot in 1948, to see paratroop dogs landing in the Arctic to learn how to rescue plane crash victims.